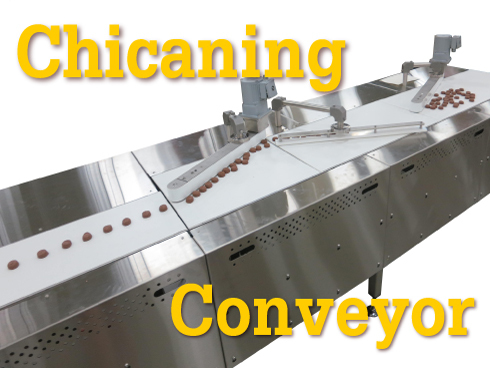 The purpose of chicaning conveyor systems is to orient products into a single file line. In this application, we are taking chocolates from a multi-row array and singulating them for the downstream packaging equipment. This system consists of 6 conveyors and a sawtooth piece of UHMW nicknamed the “turbulator”. The four main line conveyors are a combination of Dorner’s 2200, 7200 and 7360 conveyor lines to create a custom low profile, stainless steel conveyor that can provide tight transfers. Each main line conveyor increases in belt speed as the chocolates progress down the line. This helps provide a gap between the chocolates while creating a single file line. The two small chicaning conveyors are a custom creation using stainless steel materials with a slight influence from our 3200 product line. These conveyors needed to have a large belt speed range to work with the main line conveyors. This is because the chicaning conveyors need to have a higher belt speed than the main line to increase the gap between product. The Turbulator’s sawtooth shape is designed to break up any bunches of chocolate that pass through the system. See more options to control product flow on your packaging and processing lines.